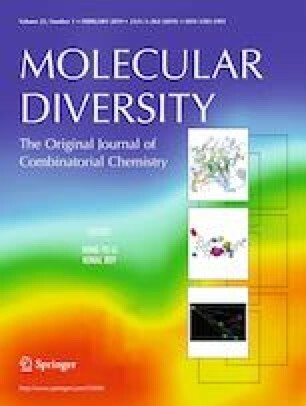 A series of 5-oxo-4H-pyrrolo[3,2-b]pyridine derivatives was identified as novel class of highly potent antibacterial agents during an extensive large-scale high-throughput screening (HTS) program utilizing a unique double-reporter system—pDualrep2. The construction of the reporter system allows us to perform visual inspection of the underlying mechanism of action due to two genes—Katushka2S and RFP—which encode the proteins with different imaging signatures. Antibacterial activity of the compounds was evaluated during the initial HTS round and subsequent rescreen procedure. The most active molecule demonstrated a MIC value of 3.35 µg/mL against E. coli with some signs of translation blockage (low Katushka2S signal) and no SOS response. The compound did not demonstrate cytotoxicity in standard cell viability assay. 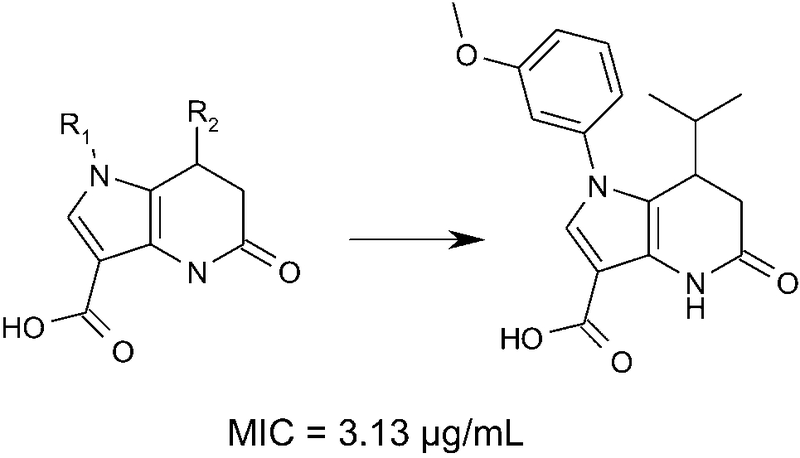 Subsequent structural morphing and follow-up synthesis may result in novel compounds with a meaningful antibacterial potency which can be reasonably regarded as an attractive starting point for further in vivo investigation and optimization. The authors would like to kindly acknowledge the Ministry of Education and Science of the Russian Federation, government Grant 20.9907.2017/VU (expert opinion, discussion and manuscript preparation) and Russian Science Foundation №17-74-30012, IBG RAS Ufa (biological evaluation and compound selection). Authors thank Maria M. Puchinina for help during the preparation of the manuscript. MSV, YAI and RSY have performed in silico screening procedures. MSV, YAI and AAA wrote the manuscript. DSB and GIF have collected and prepared the databases. IAO, PVS, VAA, AVA, VAT and OAD sorted out the antibiotics’ mechanisms of action by means of a double fluorescent protein reporter for high-throughput screening of ribosome and DNA biosynthesis inhibitors and edited the manuscript. AEM, RAP, SYM collected, pre-processed and analyzed the data. DAS, KSK, AVC, AKB and AAS designed and performed experiments on measuring MIC. LFZ, MAM, ZRZ, VGK and YVV performed experiments on cell viability.